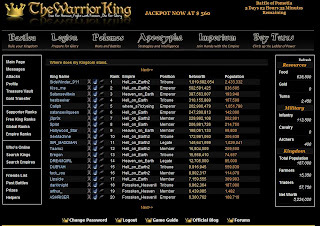 MMORG stands for Massively multiplayer online role-playing game. These games often tend to be played over a period of days. These games are based on many themes from turned based strategy to 3d games. One of such game i like to discuss here is "The Warrior King". This game is a turn-based text war game, where you fight with other kings. Each and every round exists for about 10 days. For each and every 10 minutes u get 50 turns. With those turns u have to effectively gather resources and fight with other Kings. When a round starts, you are given about 5000turns in hand and 5000 turns in reserves. The winners are awarded jackpot about 500$ and turns that can be used in next rounds. The game is currently in its development stage, adding new features in almost every round. The game has a clean interface and you can easily understand this game when u play. What a brilliant game it is !! A must play for all nerds.